I’m happy to get a tune up! A few Saturdays ago, I had a mission: to find a safe and easy bike route form where I live to where I work. I have been dying to try riding my bike to work since I have moved to Toronto but have been too chicken to try. I work at Ryerson University, right downtown and the thought of rush hour traffic makes me nervous. I decided to map out a safe route and give it a try on the weekend as a test. The original plan was to take Adelaide all the way to Jarvis and Jarvis north to Ryerson. However, even with the light weekend traffic, it was tricky weaving around the construction, parked cars and street car tracks. To make things worse, I spotted a fellow biker who had been knocked off his bike by a car . While he looked like he would be alright it gave me second thoughts about tackling rush hour. Abandoning my current plan, I decided to make a visit to the distillery district since I was close by to see what was going on. 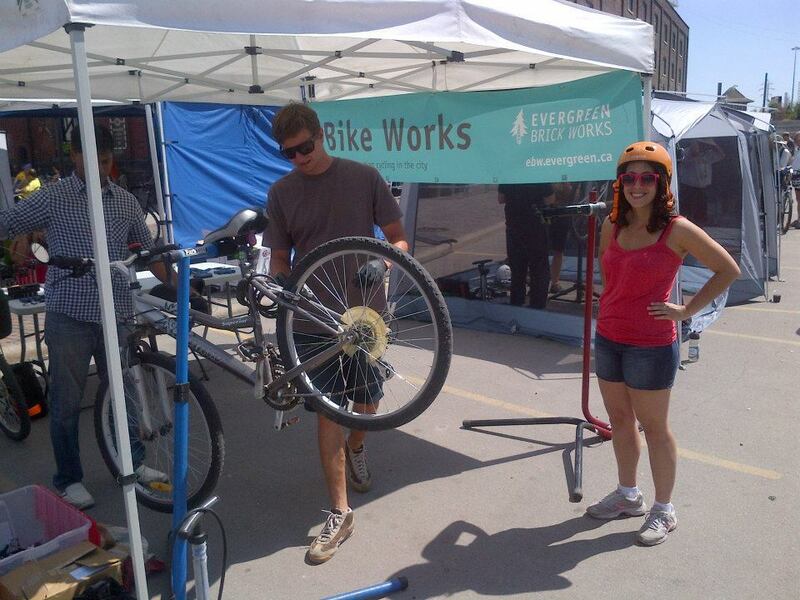 When I got to the distillery district, I discovered the MEC Bikefest Toronto where they were offering free bike repairs and tune ups, as well as 5$ workshops and clinics on how to take care of your bike. I arrived just before 11am, when they started, so I was first in line for a repair. My old Costco bike looked a little out of place amongst the other fancy designer bikes, but I handed my baby over to the repair team with pride. Two lovely volunteers from bike works tightened my kickstand, oiled my chain, pumped up my tires and replaced my rusting brake cable for free! I was tickled pink with the great service. When I tested my refurbished bike out, I couldn’t believe how smooth and fast it was! I meandered around the other vendors and managed to get my hands on a Toronto bike path map, with which I re-mapped out my bike route. this time I went along the College bike path home. It was a much safer route and I felt at ease with the relativity wide bike lane. As I turned off the main street and peddled down my quite side street where I live, I suddenly felt inspired to take on my new challenge of biking to work. Unfortunately the feeling was short lived when a clueless driver almost hit me when I was making a left turn at a four way stop. Since then I have been cycling up a storm on the weekends, but I have yet to challenge my fear of cycling during rush hour. Sigh, maybe one day when they start adding separated bike lanes (rather than removing the painted ones they already have), I will follow my dream of being a downtown bike commuter. Until then, I will remain a Wannabe.